Bharatiya Janata Party (BJP) president Amit Shah announced on Saturday that the saffron party will get rid of the Congress’ parivarvad and usher in vikasvad in Rae Bareli. “I have come here to tell you that the BJP will free Rae Bareli of ‘parivarvad’ and will start the campaign from today itself for taking it on the path of ‘vikasvad’ (development),” he added signalling the start of the party’s campaign months ahead of the 2019 Lok Sabha elections. At the gathering attended by Uttar Pradesh Chief Minister Yogi Adityanath, deputy CM Dr Dinesh Sharma and BJP UP chief Mahendranath Pandey among others, Shah said that the BJP is responsible for bringing Rae Bareli on the fast track of progress and develop it by leaps and bounds. Hailing the Yogi Adityanath government for the work done in the last one year since it came to power, Shah said that the ground breaking ceremony of the community health centre and primary health centre were carried out only lately even though the Congress ruled the district for years. “This land has sent the biggest leaders from the Congress to the Parliament but when I saw this land, I could not believe that some of India’s biggest politicians have been elected from here,” said Shah referring to Rae Bareli’s stature as the constituency of former prime minister Indira Gandhi and former Congress chief Sonia Gandhi, who is the current Member of Parliament from the constituency. “We will develop it as an ideal constituency and a model district,” he said. Shah also attacked Congress over the acquittal of Swami Aseemanand in the Mecca Masjid blast case earlier this week. He alleged that the grand old party was trying to “defame” Hindus. “I want to tell Rahul ‘Baba’, your leaders, P Chidrambaram, Sushil Shinde etc talked about saffron terrorism. You must apologise to the nation,” he said. “Shouldn’t Congress apologise for creating the false allegation of ‘saffron terror’?” Shah asked the gathering. Shah also praised the Adityanath government for establishing the rule of law in a state which “was known for ‘goonda raj’”. The BJP president also underlined the schemes and policies of the government led by Prime Minister Narendra Modi at the Centre for the welfare of farmers. 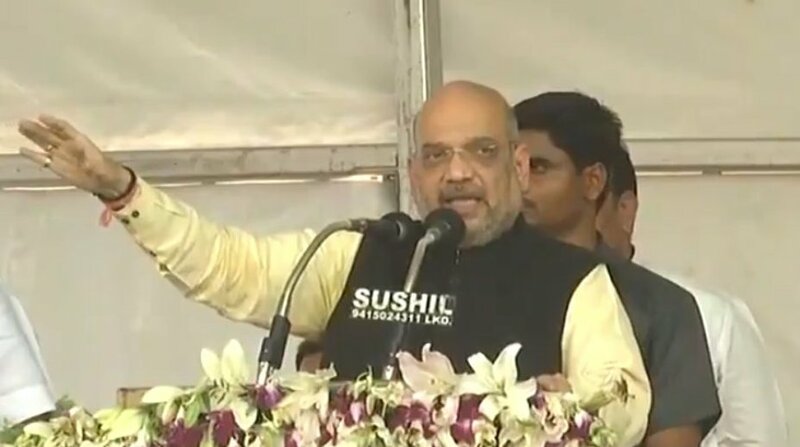 Shah said he wanted to tell Rae Bareli people that he had been touring all over the country and “I can say Narendra Modi government will come back with a bigger mandate in 2019”. Though the BJP swept Uttar Pradesh in the 2014 general election, the BJP lost both Rae Bareli and Amethi, which is represented by Congress president Rahul Gandhi in the Parliament, to the Congress. Barring three exceptions – 1977, 1996 and 1998 – Rae Bareli has stood with the Congress since 1952.